Samuel Kitcherel (Kitcheral or Kitcherell) was born in 1619 in Rolvenden, Kent, England. His parents were Joseph KITCHEREL (1587 Sandwich, Kent, England – 1619) and Margaret SHEAFFE (1598 – 1682). He married Martha CHAPMAN in 1643 in Hartford, CT. Samuel died in 1650 in Hartford, CT.
Martha Chapman was born 7 Apr 1616 in Digswell, Hertfordshire, England. Her parents were Simon CHAPMAN and Mary [__?__]. I’m not sure how Martha got to Hartford. Rolvenden is about 90 miles away from Digswell, so it doesn’t seem that she and Samuel grew up together. After Samuel died, she married Anthony Dorchester on 2 Jan 1650/51 in Hartford, CT. Martha died 17 Dec 1662 in Springfield, Mass. 2. 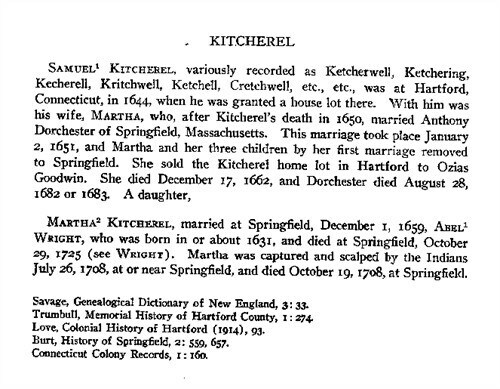 Samuel Kitcherel c. 1640 Hartford, CT 9 JUN 1651 Springfield, Mass. 3. Hannah Kitcherel 4 JAN 1645/46 Hartford, CT 29 APR 1658 Springfield, Mass. Anthony Dorchester (ca. 1620-1683) was probably born at Dorchester, Dorsetshire, England. He may have been among the first settlers of Higham, Massachusetts, before settling at Windsor, Connecticut, with the Dorchester Company. He and his first wife, Sarah (d. 1649), were married ca. 1643. They had three children, 1644-ca. 1648. The family moved to Springfield, Massachusetts, in 1649. Anthony married 2) Martha Chapman Kitcherell (d. 1662), a widow with two children, in 1650. They had three children, 1651-1656. He married 3) Elizabeth Cummings, widow of John Harmon (d. 1699), a widow with three children. Anthony died 28 Aug 1683 in Springfield, Hampden, Mass. Benjamin’s wife Sarah Burt was born 4 Sep 1656 in Springfield, Mass. Her parents were Jonathan Burt (1624 – 1715) and Elizabeth Lobdell (1631 – 1684). After Benjamin died, she married 14 Feb 1676/77 to Capt. Luke Hitchcock Jr. Luke died 27 Jan 1726/27. Sarah died 9 Nov 1746 in Springfield, Mass. Benjamin’s date of death, 29 Mar 1676 is a suspiciously close three days after the Nine Man’s Misery Massacre in King Philip’s War. However, I can find no record of Benjamin’s military service or cause of death. See my page Nine Men’s Misery. Sarah’s husband Joseph Stebbins was born 24 Oct 1652. His parents were Lt. Thomas Stebbins and Hannah Wright. Joseph died 15 Oct 1728 at Springfield. Sarah perhaps married (2) Joseph Williston. This entry was posted in 14th Generation, Immigrant - England, Line - Miner, Violent Death and tagged Springfield Pioneer. Bookmark the permalink.